Full Swing Golf Simulator | OhGizmo! As fun as Golden Tee might be, spinning a trackball can’t really compare to swinging a golf club. So if you’ve got the space and the budget, you might want to consider installing one of these Full Swing Golf simulators instead. The system uses a Windows-based PC and video projector to provide an almost life-sized view of the current hole and course. But the real key to the simulator is two curtains of infrared beams that sit just in front of the screen. The beams are emitted at 60,000 pulses per second, and as the golf ball passes through them the software on the PC is able to immediately calculate its trajectory, which is then translated to your virtual ball in the game. For installation you’ll need a room that’s at least 20 feet deep, 13 feet wide with a 10.5 feet ceiling, and since the surface of the hitting area includes sand (in addition to fairway, light rough and heavy rough) you might want to find a way to keep the cats out of there. 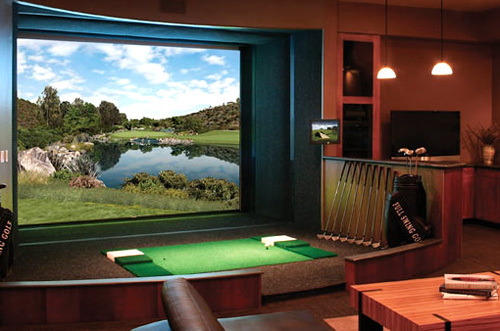 Not surprisingly the Full Swing simulator will run you about $55,000, but they’ve recently added online play so if you miss hitting the links during the Winter months, this should give you the chance to enjoy a round in the comfort and warmth of your home.